Microsoft announced that it is currently working on adding advanced protection capabilities for Office 365 Home and personal subscribers. The company is working on bringing File Restore feature to all OneDrive subscribers. 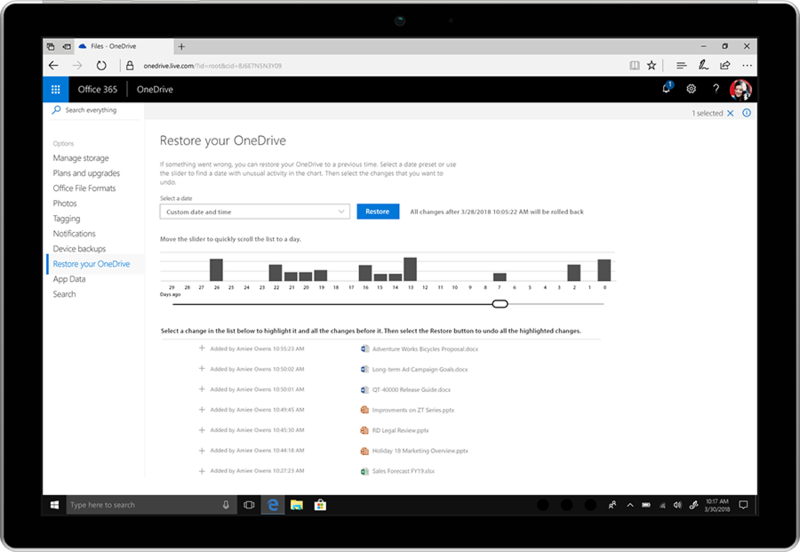 The File Restore feature was earlier available for OneDrive for Business customers. The feature allows users to be able to restore their OneDrive to its previous state but within last 30 days. Microsoft is also working on introducing ransomware detection and recovery feature for Office 365 subscribers or users. This new feature helps OneDrive users to detect ransomware attacks and help them restore their OneDrive to an earlier point from were it was left of. The user is alerted via an email, mobile or desktop notification for a ransomware attack detection. Microsoft also helps users to take them through the recovery process to make them select the date and time of the attack pre selected in Files Restore. The Office 365 users will be able to keep their information secure and private by setting a password to access a shared file or folder to prevent any unauthorised accessing of files. Microsoft is also offering email encryption to Outlook.com users which makes their emails end to end encrypted. The Office documents which are required to be attached in the email are also end to end encrypted even if the user downloads them on his PC. The ransomware detection and recovery option is now being rolled out to the Office 365 subscribers and will be available to all in the coming days. The other features like email encryption and more will be rolled out in the coming weeks once the company completes the roll out of the ransomware detection option. Microsoft is also adding advanced protection to encounter phishing links. The advanced protection you will be able to check the links you click in Word, Excel and PowerPoint in real time and know the destination website or does it contain any malware which could infect your PC. If the link is suspicious, you will be redirected to a warning screen recommending you don’t access the site. The phishing links option, the company is expected to roll out in the second half of 2018.